In 2014 womens basketball icon Cheryl Miller stormed the Langston University campus, taking over the reigns of a respected, but modest HBCU womens basketball program and elevating the prestige and attractability of the 4,000-student school located in the sticks of Oklahoma. She inherited a proud team that went 20-13 and lost in the first round of the NAIA national championships. Then, Miller, who is once again in line for a return to big-time Division 1 coaching, abruptly departed with an overall record of 49-12 and two NAIA Tournament appearances. The Lady Tigers’ short-term loss immediately turned into a long-term gain, as former LSU star and experienced assistant basketball coach Elaine Powell was next up. Powell, a legendary player in her own right, who honed her skills as a child on the bumpy playgrounds and crowded rec centers of Monroe, Louisiana by going head up with the boys, not only maintains the strong recruiting platform Miller established, but her credibility as a player and coach is impeccable. I didn’t take this job to just come in, win and think about the next job Powell told The Shadow League in an exclusive interview on Thursday. I’m here to continue the Langston women’s basketball legacy as long as I can. Powell knows that following a legend is a tough deal, but she wont be hearing any footsteps or chasing any ghosts. Powell: Not saying that I’m going to erase everything Cheryl has done here, but like you said before, Im capable of doing it. Its very hard especially when you mention Cheryl Miller. I idolized her. She did what she did. You can always want to idolize them people but at the end of the day I have to have my own identity and make sure Im doing things that work for me. I already know my job is to win games…build strong relationships and just win games. But those ARE some huge shoes to fill (laughter). Powell plans to bring her own new, esoteric flair to the Langston program. “You can’t get caught up or be negative so that your kids aren’t responding to you. Just from learning over the years with the different types of coaching I had, they made it fun to learn, but also made it fun to play whether you win or lose. If you got out there and compete and fight hard and you lose, then as a coach you can accept that and you are accomplishing something. Powell is a couple of basketball generations younger than Miller as well. She played during the glory years of womens basketball, from the inception of the WNBA up until, she says, the game started changing and also adapting the softer rules and tendencies incorporated by the mens game. Powell: When I played I know for sure the game was more aggressive. Quicker tempo. Bigger players. I remember Nikki Teasley being a 6-0 guard, they related her to Magic Johnson… It was faster, quicker, stronger, and bigger players. You talk about me playing against 6-6 Lisa Leslie in the WNBA finals. Or a 7-2 Margo Dydek. Cheryl and Lisa are probably the top two players of all-time at their positions. It was just a privilege to learn and be a sponge to the game and now I’m paying it forward. Everything I learned from playing to college to pros to overseas…just trying to give back to the kids coming in. Despite losing a mythical figure on the bench, Langston University didnt downgrade a bit, as far as hoop respectability goes, when it announced the hiring of Powell, the first player in LSU history to be drafted into the WNBA. Powell has a glistening basketball pedigree and impressive history of accolades. In two years at LSU, Powell averaged 19.1 points per game (fourth in school history). She finished her career as LSU’s 11th all-time leading scorer (1,163 points). Powells elite oncourt experience and previous assistant gigs for womens basketball programs at Alabama A&M, Ohio University and Grambling State University, have prepared her for this head coaching opportunity. She spent nearly a decade balling in the WNBA (1999-2008), where she carved a name for herself at the point guard position and started to get that coaching itch as her career came to a close. Powell: As I advanced in my playing career I saw myself coaching. As you begin to play basketball you go through different stages from starting to not starting to being more of a bench coach and then a full coach. Me being a point guard, that helps the transition out a lot because the point guard is the most important position on the team. You have to be more vocal and be a leader and learn to recognize things. She was a three-time WNBA champion while also honing her coaching skills under former coach and Detroit Pistons player, Bill Laimbeer. She was the kind of player a former Detroit Bad Boy Piston would embrace; intelligent, focused and tough as nails, while exuding a controlled chaos that always kept her a step ahead of the competition. Powell: Laimbeer showed me how to make the team into a close knit family where you came in and worked and got your job done. A more professional style. You come in training camp, you’re in shape. You learn what you need for the season…every playoff game we were in we would always go out as a team and do dinner. Doesn’t matter where we were playing each round, the further I got into the playoffs the more we sat around and made it more family like. You become sisters basically and that’s important if you plan on winning games and championships. You have to have each others back and all serve one purpose. Laimbeer fed Powells initial coaching curiosities by exuding an old school, professional, close-knit focus on camaraderie. The college assistant jobs that followed shaped her coaching integrity, provided valuable experience and helped her learn what it took to become a corporate leader. Powell: Grambling was my first job. I was an assistant coach for the Lady Tigers from 2008-12. The one thing I admired about Coach Rogers the most was that she treated everybody with respect. Doesn’t matter if you were the President or the janitor. That’s the most important thing. Just treat people with respect because each person that’s in that program or organization or university, you gain value from them. Then I go to Ohio in 2012 with Coach Semeka Randall and its learning the business side of basketball. I was also with her at Alabama A&M,she let me venture out more and take over practices more and hone my skills..stuff like that. So I think from each coach you learn something completely different but the thing that stuck out to me the most was Coach Donnita Rogers and how she treats people. Rogers was responsible for Powells first job with Grambling and now as Langstons Athletic Director, she called on her protege to keep the program moving in a flourishing direction. “Elaine Powell is a proven leader whose dedication and commitment to excellence has shown in her work while coaching at the NCAA DI level for more than 8 years…She comes from a championship pedigree (at LSU), which is what we strive for here at Langston University. We look forward to her bringing that same enthusiasm, devotion and…approach to our program,” said Donnita Drain Rogers, when Powell was hired in May. Besides for the fact that Miller left her some formidable talent and head coaching was the next logical step for her, Rogers presence at the university is what sealed the deal for Powell. Miller gave a lot to Langston, but her time was brief and at the end of the day it was a stepping-stone job for her. Miller had already tasted the highest levels of pro and college coaching and need a test-run to show she still had the goods. Her mission was accomplished. Now, Powell, a rookie in the HC game, has the unique opportunity to use her first leadership experience to learn how to build a program into a powerhouse, rather than just use it to bounce to a major university. Powell fancies herself a players coach and its clear that her basketball knowledge isnt limited to the women’s game, as she broke down why Cleveland is behind 2-1 in the NBA Finals. Powell: LeBron is the only one on that team thats been in the position of winning a championship. He knows how hard you have to lock in each possession counts, turnovers count, free throws , missed assignments on defense all of that stuff counts. LeBron knows that and people keep trying to relate these guys to the The Big Three he formed in Miami, but Kyrie Irving and Kevin Love isnt as good as Dwyane Wade and Chris Bosh. Bosh is definitely more effective than Love. He defends better, he rebounds better, he can block shots and protect the paint. Loves not aggressive and hes not good with his back to the basket. You look at Kyrie Irving. Hes great with the ball, but he cant defend. 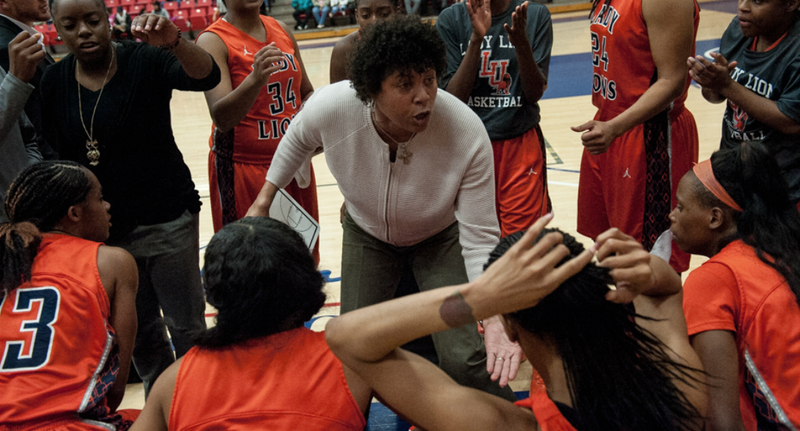 The woman indisputably knows her hoops on all levels and no matter how long she decides to remain at Langston, there is a future for her that is bright and unwritten. It could eventually include a switch to the mens game, because the resume she is building is that official.